UPDATED Version: Alternative Download Format (1.0.4.0 .BAT): Here. Purpose: Incorrect Date and Time stamps can cause activation failures. Purpose: Can cause failures during install, file saving, etc. Failure to have this access may result in program crashing. 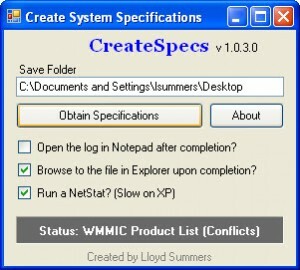 Purpose: Obtains system specifications to check for incompatibilities. from the TEMP folder. Issues here can impact File>Saves and corrupt files. is critically important for the software packages to work correctly. some packages require specific internal ports for internal communication. These can be blocked by firewalls, or hogged by third-party resources. This gives us an idea of the status on these ports. 1920 and 1921 errors primarily during installations.